Updated custom home! 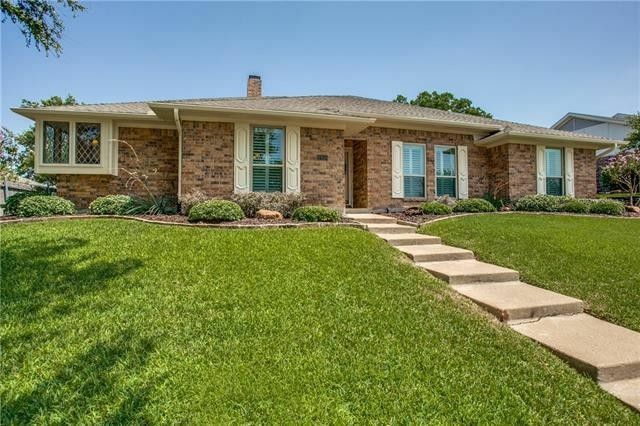 Beautiful drive up & great landscaping lead to immaculate home. Two living areas include fireplace, built-ins, bar & wall of windows to covered flagstone patio with recently stained fence. Remodeled Kitchen will knock your socks off-it's gorgeous! Custom cabinetry, wood floors, granite countertops, tumbled marble backsplash & upgraded appliances! Hardwood floors extend to Breakfast rm. Front bedrm has bookcases-this makes a fantastic home office. 2nd bedrooms share access to full bath. Lovely Master is oversized & Bath is pleasantly spa-like. Custom wall of storage in garage. Additional updates: windows, garage door, landscaping & exterior paint. All that's left is for you to move right in! Directions: From President George Bush Turnpike exit Firewheel Parkway. Turn Right. Go to Centerville and turn right. Turn Left onto Club Meadow Drive. House is on down and on the left-hand side. Exclusions: Wireless security system, Tvs(mounts can stay), Living Room Curtains, Backyard Fountain & 2 large planters.